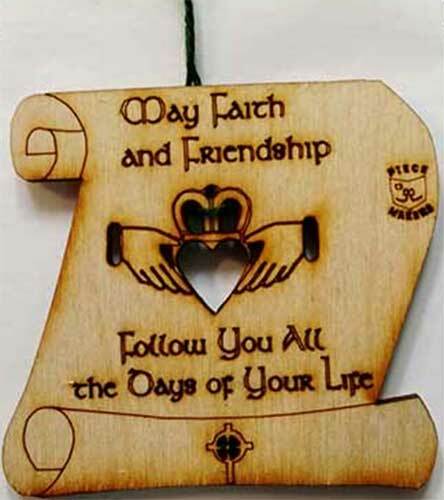 The Irish blessing on this Claddagh ornament says: May Faith and Friendship Follow You All the Days of Your Life. This scroll shaped wooden Irish Christmas ornament features the Claddagh, Ireland's symbol of friendship, loyalty and love. The Irish Claddagh ornament is enhanced with an Irish blessing along with a small Celtic cross. The wooden Claddagh ornament measures 2 1/2" wide x 2 1/4" tall, it is ready to hang on your tree with the included green string or you may remove the string and utilize the ornament as a refrigerator magnet. The Irish ornament is made in Ireland by Piece Makers and it is gift boxed with Claddagh and Celtic cross history cards, complements of The Irish Gift House.